Welcome to another #WIPWednesday! 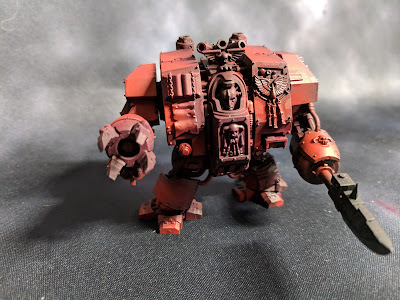 Last week I finished off a Contemptor dreadnought and added some work on some Rievers. This week I went back mostly to the assembly line and put together a bunch of Marines of various stripes. 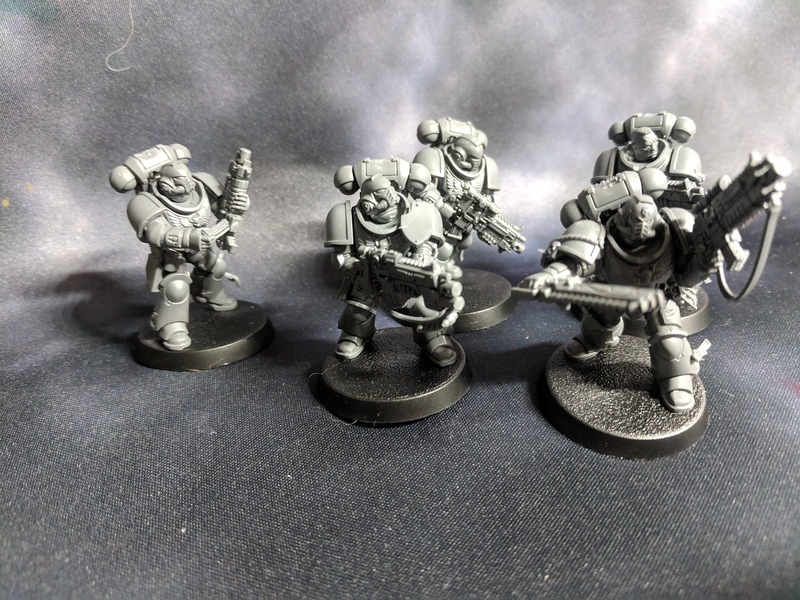 I started with assembling a squad of Intercessors, largely by the instructions, though I did add a Chainsword from a Vanguard Veteran for the Sergeant. The heads in the above picture are not actually attached (more on that later). Next up, I knocked out a squad of Terminators since, with the new Bolter rule, they intrigue me and I would like to get them on the table. While the new rule definitely helps, I do think their mandatory Power Fists might still hold them back, keeping them a bit too pricey to make the cut in more streamlined lists. Either way, I was happy for the excuse to put them together. 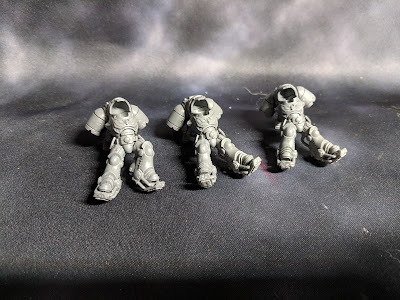 Like the Intercessors, I did not attach the heads; primarily because I expect they will likely end up a different color than the bodies, and airbrushing them separately will be convenient. 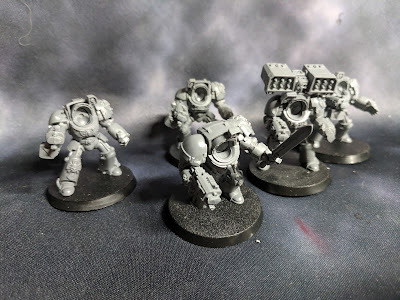 I also magnetized the missile launcher and have the storm bolter arm simply pinned on another so I can potentially swap it out with a heavy weapon option should I be so inclined at a later point. Next, and finally as far as assembly goes, I started assembling some Inceptors and Guilliman. Neither are particularly close to done at this point, but progress nonetheless. To wrap out this week's WIP, I managed to get primer on the Intercessors, Terminators, and a Librarian Dread. I followed this up with red base coats on the Intercessors and Dread. 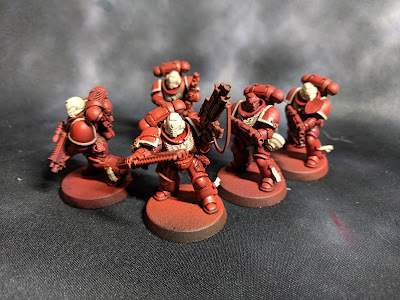 As I wrapped up last night, I even managed to get a pin wash on all the red as well as putting in the bone edging and helmet base coats for the Intercessors. I have an RTT this weekend and, depending on how tonight goes, I may try to sneak in this Librarian dreadnought into the army. Lists are due tomorrow, so I will need to be a lot closer to done than I am right now in order to get him in. As you can see, right now none of the details are even blocked in, with just some of the red blends down. That's it for this week - hopefully next week I'll have some completed models to show off, and might get to work on some terrain as I'm hosting a little bit of a gaming weekend next weekend and we could always use more terrain to play games on. What have you all been working on? Share pics on our Facebook page or links in the comments; would love to see what you've got.